Kea Island, also known as Tzia (Jia), is an island with unique natural beauty, and intense traditional character that belongs to the Cycladic complex of islands. Kea has valleys, streams, hills, orchards, olive groves and beautiful sandy beaches that along with the picturesque villages of the island create an idyllic environment. 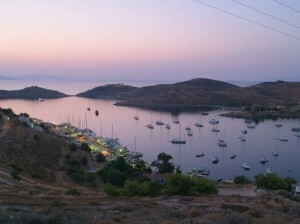 Kea is located between the southeastern side of Attica and the islands of Kythnos, Syros and Andros. It covers an area of 130.5 square meters; it has a coastline of 81.5 kilometers, and a population of approximately 2.500 residents. It is the ideal place for those who wish for peaceful and relaxing holidays, and for those who want to enjoy the hot sun, take walks in the picturesque seaside and mountainous villages, and explore the natural beauties of the island. The short distance from Athens makes Kea ideal for weekend, and not only, trips. Chora, which is also named Ioulida, is the capital and the administrative centre of Kea, and it located in the centre of the island. It features the traditional houses with the tiled roofs, the cobblestoned streets and many stairs. Korissia, also known as Livadi, is the port of Kea and it is in the west side of the island. The beach of Korissia is very picturesque with lots of stores, bars, café and restaurants while the area has some of the best beaches of the island as well as important archaeological and historical sites, something that makes it the most popular area of Kea. Pisses is a picturesque seaside village in the west side of the island, built on a cove. Pisses is famous for the wonderful sandy beach, and the impressive archaeological site of Poiiessas. The settlement of Otzias is located as well as on a cove but in the north Kea, it is a beautiful village with stone houses, and a wonderful beach with tamarisk trees. Koundrouros is in the west side of the island, and it is popular for its beautiful bays and beaches as well as the mansions and the wind-mill houses. The settlement of Vourkari is a cosmopolitan resort in the northwest Kea with lots of bars, café, taverns and restaurants along the seaside street. There you will see luxurious yachts and the celebrities that cruise the Cyclades. In Kea the visitors can choose from several beautiful beaches. Some of them are located in small bays while others are long sandy beaches. Most of them have restaurants, café and taverns either on the beach or in close distance. For the visitors that seek adventure there are beaches that provide equipment for water sports. The most popular beach is Gialiskari, that has golden sand, turquoise waters and tamarisk trees along the beach. A few kilometers south of Gialiskari is the beach of Korissia with thin sand and calm waters. = In the middle of the west side of the island lies the bay of Ksila that has smooth sand and crystal clear waters as well as the long beaches of Pisses and Koundouros, that create rows of small bays with thin sand and crystal clear waters. In the west side of Kea there are some of the best beaches of the island such as Orkos, Sikamia, Psili Ammos, Kalidonichio and Spathi. they are located next to each other, and are famous for their magnificent sand. In north Kea is the beach of Otzia, the longest beach of the island. It is a bay protected from the air with tamarisk trees that offer their shadow to the visitors. Kea has a long history that provides for a rich archaeological heritage. The Ancient Site of Ioulis and the Medieval Castle are an example of this. There are several religious monuments such as the Episkopi Monastery, Agia Anna Monastery, Church and Tower of Agia Marina and Cathedral of the Annunciation. Also, a visit to the Archaeological Museum is a must for its collection of artefacts from the island. Kea is very famous for its antique car rally held every year in June. The main festival of Kea is in honour of Agios Charalambos held on 10 February, with music and dancing. In August, one can attend Simeonidia which includes theatrical and dance performances, art exhibitions etc.